Lombok, Bali’s beautiful next-door neighbour, rarely receives the attention she deserves. Although there are only 35km of sea between these two islands, the physical and cultural distinctions are considerable. Towering mountains, mighty waterfalls, pristine white-sand beaches, magnificent coral reefs, pearl encrusted shores, a unique Sasak culture and tranquillity are among Lombok’s many charms. In general, Lombok entices the more adventurous travellers who have, perhaps, already explored Bali and are hungry to journey further afield. The island is also a haven for those in search of peace and quiet. A visit to Lombok is an opportunity to explore a natural paradise, trek the Rinjani National Park, enjoy some fantastic diving and snorkelling, surf some of the best waves in Indonesia, and encounter a traditional, rural way of life exposing a fascinating integration of Muslim and Hindu cultures. Visitors are welcomed at the splendid Sasak festivals and Hindu ceremonies, and the island produces some remarkable handicrafts. In the tiny villages artisans can be seen at work creating textiles, baskets and pots. Predictions in the early ‘90s that Lombok was following fast on the heels of Bali in terms of tourism were never actually realised. Likewise it is a misconception to view Lombok as the Bali of 20 years ago, comparisons are inevitable but contrasts are marked and the two islands differ in almost every respect. The beaches in Lombok are beautiful. The roller-coaster road hugs the dramatic coastline around cool coconut groves, sweeping bays and towering headlands. 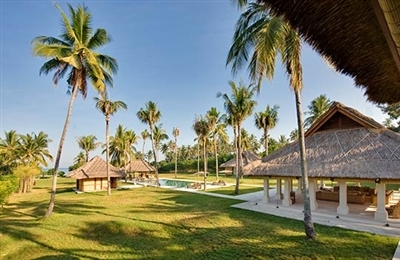 Although there are a few luxury hotels and villas in the area north of Senggigi, huge expanses of Lombok’s shores are totally undeveloped with just a few small villages dotted inland. Many of the beaches are festooned with candy-coloured jukung. These traditional canoe-shaped fishing vessels are crafted from a single hollowed out tree trunk, with bamboo outriggers and a distinctive prow decorated and shaped like a marlin’s head. Some of the island’s most spectacular coastal scenery can be found on the southern shores. Windswept sandy beaches and picturesque bays are separated by headlands and awesome rocky outcrops. The glorious crescent-shaped beaches of Lombok’s Kuta (often confused with Bali’s Kuta) and Tanjung Aan are famous for their surf breaks, and when the tide is out, the bays turn into shallow pools of turquoise water. 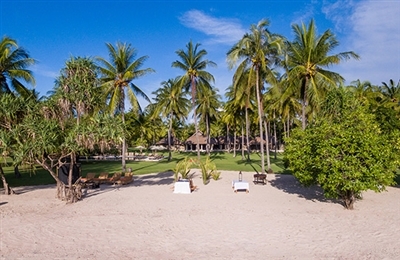 In October 2011, Lombok's long awaited Bandara International Airport opened near the township of Praya, about 40km south of Lombok's capital, Mataram, and approximately a two-hour drive from the north-west of the island, which is home to most of Lombok's luxury private villas. Although this new airport currently (Jan 2013) only offers international flights from Singapore (Silkair) and Kuala Lumpur, Malaysia (Air Asia), regular connecting flights from Bali's Denpasar Airport take only 25 minutes.